The first production of 2017 was Purcell’s Dido & Aeneas in the confines of the Space for Free Arts in a disused bunker in Helsinki’s Kallio district. There were only two performances, but by popular and critical demand, two performances were added in November. 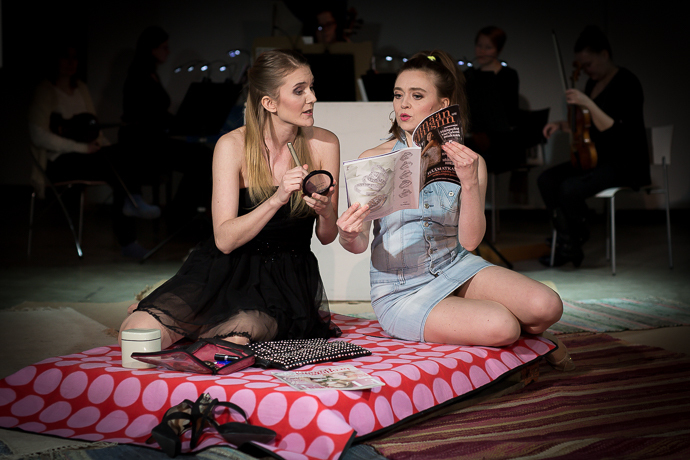 The performance was in conjunction with the English Vocal Consort of Helsinki, and all the roles in the opera were taken by members of the ensemble, including Iida Antola, winner of the Kangasniemi singing competition, in the title role. The action of the opera was transferred to the modern day TV studio during the filming of a reality TV pilot. Iko Raatikainen’s production garnered rave reviews, and created a new level of accessibility to opera and early music. The performances were accompanied by Baroque ensemble Dido’s Train.